Lots of beaches, sand, surf, sky everywhere. Why should Brits pay more for Barbados? Wonderful. Just what we need ’bout this island. The UAE and Barbados have been ranked the most expensive destinations for British tourists in a new survey published by Santander. According to the report, the two destinations cost Brits more than £100 per day in spending money. By comparison, Poland and India are the cheapest destinations, costing just £30 per day on average. These figures do not include the cost of hotel accommodation or flights. With a direct flight to Barbados costing an average of £3,136 – flying out on 27 July, the busiest week of the summer – a couple going away for two weeks could expect to pay around £12,900 for their summer holiday, once accommodation is included, the report stated. It is already more than halfway through the year and this is a time perhaps that our tourism policy planners are focusing on what marketing strategies can be effectively put in place to build on the first quarter increase in visitor arrivals. As always, it is almost impossible to accurately predict what is going to happen in our global marketplaces and how that could impact on numbers, average stay and spend. Important issues include the fall in the value of the euro earlier this year and whether this will be further impacted with the eventual solution to the Greek crisis. What effect will the first Conservative British government budget since 1995 have on the disposable income of most Brits? And finally, there is increased speculation about an impending recession in Canada, just at a time we were experiencing improved arrivals and airlift. Having lived in Canada for some time, I know there is a psychological threshold when the Canadian dollar falls below 80 cents compared to the United States dollar. Naturally, Canadians then start to question whether they are truly obtaining value for money at holiday destination choices. It becomes an imperative to clearly demonstrate that we can offer a competitive product by at least attempting to reinforce component parts of the tourism industry that are more affordable. You have to love the guy. Typical Branson press conference, this time about Virgin Cruises taking to the water in 2020. The Italian shipbuilder stuffed shirts (who aren’t bad guys at all) standing there in their US$2000 suits with two hundred dollar silk ties. Sir Richard arrives in his helicopter with two lovelies – and he’s wearing red short pants, a Virgin Cruises Captain’s shirt, hat and not much else except red runners with no socks. So half way through the press conference Sir Richard comes up with a pair of scissors, says he can’t stand executive ties and starts cutting. Yup, I love the guy. But don’t forget in all this: Barbados must get a piece of this. If our government can’t get at least one of the new Virgin ships based out of B’town, it will be a sad and dark day. I had hoped to dedicate this week’s column to the new measures put in place announced in the 2015 budget to stimulate spending, especially in the tourism sector. Unless I missed something while trawling through the 57 pages, not a single ‘incentive’ has been announced that would be likely to encourage increased domestic spending across the sector. Conversely, many could fairly claim that the additional $200 million in taxation annually will further restrain people’s ability to take a ‘staycation’ or enjoy one of many excellent restaurants. Government Broke: VAT refunds two years past due. In fact private sector led initiatives like the re-DISCOVER dining promotion have been forced to scale down any paid promotion, due to the continued inability to reclaim due and payable VAT refunds, now overdue for more than two years. This in itself is ludicrous and short sighted as many of the participating restaurants do not qualify and are unable to apply the reduced rate of 7.5 per cent VAT, but obligated to pay the higher 17.5 per cent rate. So Government could be easily losing up to $2 million a year in lost taxes. Add the duties and taxes lost in the included wine element and that figure could well be significantly more, let alone the employment this promotion generates. Whether travelling on business or pleasure, I usually hire a car, because for me it adds a huge extra dimension to the experience and dramatically increases the options available. With an imminent budget on the horizon, I would implore the Minister of Finance to look again at our car rental sector, if we are going to maintain the recent increase in visitor arrival numbers. Personally I do not think this segment of our tourism offerings gets the attention it deserves and that is probably partially due to the lack of knowledge and understanding of the enormous contribution it makes. Just one of our larger vehicle rental operators has a fleet of almost 130 cars. If you average a rental period at 7 days, with a driver and at least one passenger, that amounts to over 13,000 persons each year. Of course the fleet size varies enormously, but from recently writing to over 30 Barbados based entities offering car rental, it gives you some idea of the importance in economic terms they play overall. Rarely do I pay more than US$150 for a week’s rental in North America or GB Pounds 100 in the United Kingdom for a compact car, so for many of our visitors it can be quite a shock to pay what are considered ‘normal’ rates on Barbados. But it’s easy to see why, because of the taxes on purchasing cars here is staggeringly different to those where our major source markets emanate from. Also surprising is the sad and difficult to understand logic behind the decision not to lower the rate of value-added-tax (VAT) on vehicle rental when the adjustments were recently made to hotels and some restaurants. Barbados luxury tourism image becoming a long-term liability? “Barbados an upscale tourism destination? Really? Open your eyes and your nostrils! 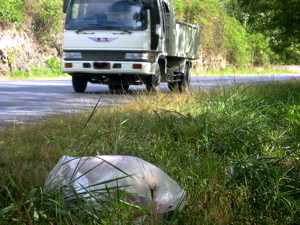 Clean up the garbage strewn throughout this island. Barbados has never been, and will never be, a mass-tourism destination. We’re too far away from our main European markets, the farthest Caribbean destination from the North American markets, and not different enough from the closer South American markets to ever sustain mass-tourism at competitive rates. Nevermind considerations about the small size of the island, the need to import most supplies for tourists and the overpopulation of the south around the Bridgetown corridor – it is the higher transportation costs and longer time necessary to the destination that ensures we can never be competitive on a mass basis. And that’s good on the cultural / lifestyle side of the coin, but bad on the economic side. That choice worked in the past, but there are problems now that the younger generation of Brits (our main market) doesn’t have the money that their parents did. Blame it on the weak UK / European economies, blame it on out of control EU socialism and mass unsustainable immigration into the UK from Third-World African, Middle East and near-Asian countries. Blame it on whatever you like, but it is obvious that younger Brits don’t have the disposable incomes that their parents once did. So our largest group of tourists – the Brits – continue to age, while the next generation is either going elsewhere or can’t afford Barbados like they used to. This is not a good trend for Bim. What’s to be done about this demographic trend of aging Brit tourists and retirees? I’m no expert, but obviously from the lack of ideas, plans and strategies emanating from government and the tourism organisations, I’m not the only one without a clue about what to do. Barbados is an upscale tourism destination? Really? Until we do that, the demographics of our tourism business won’t matter and we will continue to lose our image of an upscale destination. While at first this week’s column may seem to stray from the subject ‘matter’ and purpose, the consequence of certain actions has a direct negative effect on our tourism performance. As a business we get absolutely no ‘free’ state collection of garbage. We sort and separate everything we can with the wonderful assistance of B’s Recycling and virtually everything else we pay private contractors to collect and dispose of at a considerable cost. 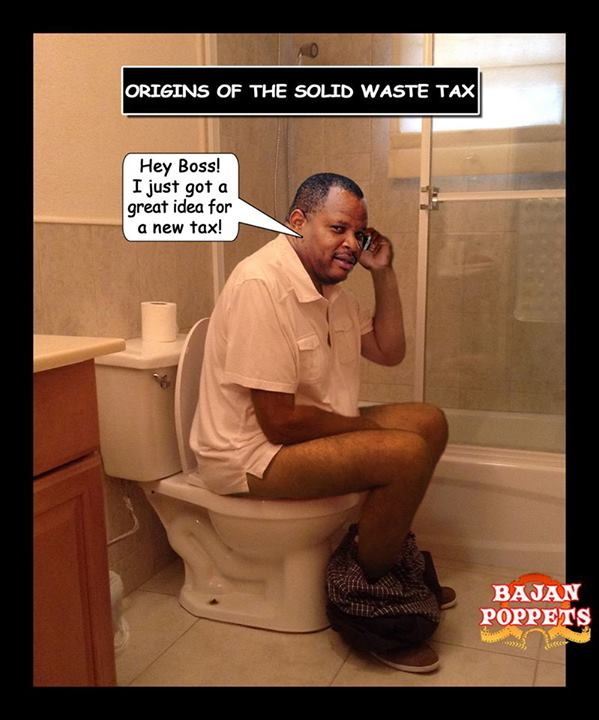 Therefore when the Municipal Solid Waste Tax was imposed, almost without warning, the additional (in our case) $8,000 a year in further unbudgeted taxation was especially irksome as we have been asked to pay for something we do not in any way benefit from directly. Compounding this already unfair situation is the announced tipping fee which the waste disposal companies will be forced to pass on to their customers like us. This at a time when we are among many businesses who have been forced to wait more than two years for submitted VAT refunds without any interest being paid. Clearly the commercial banks will not extend interest free overdrafts to companies like ours to allow for Government’s inability to meet their obligations, so the financial challenges are further compounded as time goes by.